Based on discussion in the comments of my last post as well as here and here, I think I should clarify some points about my alternate universe theory as well as note a few more ideas that I’ve been pondering over the last 24 hours. Spoilers follow. Please feel free to read my previous posts on Battlestar Galactica. I don’t know about other proponents of the alternate universe idea, but I’m not saying that all the similarities between our universe and the BSG universe are intentional. Rather, I’m proposing the opposite. So, itâ€™s not the similarities that are intentional, itâ€™s the differences. This allowed the writers to draw on all sorts of material from our universe and twist it around to suit their needs. The evidence in the show might support an alternate universe theory, but what I’ve posited so far doesn’t address how Starbuck traveled or how information might travel between the two universes. Others have pointed out that using a singularity as a conduit between two universes is an SF trope, and it is. It’s also not Hard SF, so my thoughts here are grounded in the evidence in the BSG story, not in actual science. I don’t think the show is trying to be Hard SF, but I know others disagree. With only two hours to go before the end of the series, we still have several important unanswered questions, such as the nature of the Lords of Kobol and the head characters. We don’t know where the Lords of Kobol came from, who made them, or where they went after the exodus of the tribes. What if they went to our universe — or returned to our universe where they initially originated? What if the head characters are the Lords transmitting from our universe? Novas and gas giants seem to have a particular importance in this story since both are recurring elements in several episodes. What if novas and gas giants are somehow conduits or places where the barrier between the two universes is thin? If that’s the case, novas and gas giants might be places where signals between the two universes are stronger. The original nova of the Ionian Nebula when the 13th Tribe left Kobol may have directed them to our Earth, but they misunderstood the signal and founded the 13th Colony, calling it Earth. Later, Starbuck returns (in “He That Believeth In Me”) via the remnants of that nova and the signal penetrating it activates the Fab Four, causes the fleet to lose power, renews Six’s Opera House dream, and also affects Roslin whose chamalla use made her more susceptible to the signal. In real life coincidental events do not necessarily mean a cause and effect relationship, but in fiction the reverse is often true. These events are all connected. Going back further in “Maelstrom,” Starbuck disappears into the storm system of a gas giant, possibly the swirl of the Eye of Jupiter. In this episode, the first time Starbuck clearly sees the Eye of Jupiter in the storm system of the gas giant, but does not follow it. Later, on a second flight, Starbuck’s Viper seemingly just explodes in the atmosphere of the gas giant. The first event is seen from Starbuck’s point-of-view, the second is not. Instead, we see a bright light on Starbuck’s face and we’re shown her hallucination of herself as a girl. It’s possible Starbuck did see the Eye of Jupiter again, the audience was just not privy to it. 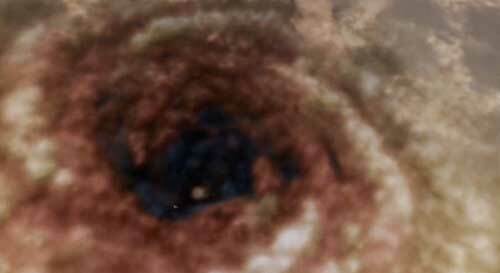 The shot of Starbuck’s Viper exploding is from Lee’s point-of-view and we see no Eye of Jupiter in the clouds. It may be, however, that only Starbuck can see the Eye in the clouds just as before. From an outside perspective, what would someone leaving one reality for another look like? Death may be a requirement. So, it’s possible gas giants and novas are conduits between the two universes. To summarize, Starbuck travels to our universe via the Eye of Jupiter storm system in “Maelstrom.” She returns via the supernova remnant of the Ionian Nebula. The signal through that conduit also activates the Fab Four and renews Six’s Opera House dreams. The Temple of Five is activated via a nova near the algae planet and a message is transmitted via this conduit, but may not have been received by the intended person. This may have happened before with the 13th Tribe and the Ionian Nebula supernova. I should note that the Morning Star is simultaneously associated with not only Aurora/Eos, but also the planet Venus, and Lucifer. Unfortunately, that post of hers seems to be gone now. Not sure why. I’ll follow up with a better Ron Moore quote after I watch the program myself. I also mentioned this on Brad Templeton’s Battlestar Blog, but that comment is no longer showing up in the RSS feed, though it is still on the site itself. Very strange. Whoever goes through the singularity — whether its as a means to another universe or to the afterlife — will be existing briefly in an “in between” space. This is the “space between life and death” that D’Anna was obsessed with. This motif shows up again and again in BSG — beaches and now doorways are just two examples. * We know that previously dead characters like Roslin’s sisters and Zak Adama show up again in the last two hours and this may be the vehicle for that. It’d be really great if we could see Dualla and Kat again. *In “Daybreak Part 1,” doorways seem to be an important element in the flashback scenes. While researching this article I discovered that the Temple of Five is also located on top of a mountain, another liminal element. I have yet to listen to the “Islanded in a Stream of Stars” podcast, but I have downloaded it. Two big reveals have evidently come from Moore during the podcast: Daniel (Cylon Number Seven) is not Starbuck’s father, and the gas giant with a moon in the foreground is not Jupiter. (Hat tip, Ken Hynek) Here’s more on Moore’s refutation of the Cult of Daniel. Starbuck’s father is Dreilide “Slick” Thrace who played at the Helice Opera House, however. Also, the gas giant not being Jupiter, but looking an awful lot like Jupiter (and again, another a gas giant…), further supports the alternate universe idea. Baltar and Kara are not normal colonial humans, but are both some kind of intermediate cylon type being. The OTG manifests as head people after their first resurrection experience. Baltar’s occurred way back in the miniseries, as his first self was blown to bits by nukes. Kara’s occurred after the events of ‘Maelstrom’. Once again, the OTG manifests as head people in cylons at will. The only problem is that Starbuck is supposed to be fundamentally different from everyone else, which means she’s also different from Baltar. However, it seems unlikely that Baltar could have survived the blast on Caprica, especially if Six did not. How did Baltar survive the nuclear explosion? Moore: Well, he survived the nuclear explosion because if you look at the shot when the windows are blown in, you see that Caprica Six is actually protecting him at the moment — she kind of grabs him and shields him with her body. One little sidenote regarding Baltar and Six in “Daybreak,” I have to wonder at the costumes: Baltar is dressed all in white (except for the red in his socks) and Six is dressed all in black. Is it just a way to emphasis that they are so different from one another? Previously I have theorized that the Kobol Opera House represents the Colony, where the blended human/Cylon community may reside at the end of the series and also from where they may continue their search for Earth. In this scenario the Opera House may represent the last iteration of the Eternal Return, when humans and Cylons lived in peace on Kobol. In my last post, Michael Hall from Galactica Science put forth the idea that projection might, and I think probably should, be utilized again. This would be an ideal ability to possess if living in a drab place such as the Colony. However, if instead BSG is taking place in an alternate universe, the Colony may be destroyed due to its proximity to the naked singularity. In this case, the Opera House may represent the “space between life and death” — either the dimension between universes or the afterlife. Just cool; I’ll have to re-read it again to absorb it all. So that’ll have to wait for tomorrow; today is to be consumed by ksh scripts and the subtle differences between available system reporting tools in various UNIX and Linux environments. Gee whiz, have fun with that! Lisa..no problem with the quote. great entry!